Comprising over 300 lots of personal correspondence, manuscripts, photographs and personal effects relating to Daphne du Maurier, her husband Lieutenant-General Frederick “Boy” Browning and the du Maurier family. It was a chance meeting in India with Daphne Du Maurier’s husband, Lieutenant-General Frederick Browning, which was eventually to lead to a long standing and close friendship between Daphne and my mother Maureen. My mother was born in India in 1922 - like many young men and women whose parents had settled overseas she was determined to ‘do her bit’ for King and Country after the outbreak of World War II, and as soon as she was able joined the forces. As one of a very few young women stationed in her particular part of India she was regularly invited to social evenings with Commanders and other important military officials. It was on one of these occasions towards the end of 1943, that she met Daphne’s husband, General Browning at a cocktail party. Known as ‘Boy’ to his friends, Browning had been posted to India to expand the Indian Airborne division. My mother was young and attractive but perhaps more significantly for Boy, who was prone to bouts of depression following tough experiences in both wars, she was a live-wire and great fun, he took an instant liking to her. He immediately suggested she come to work for him as his Personal Assistant, promoting her from corporal to captain to facilitate the move. She initially resisted saying she couldn’t join him because her indispensable bicycle was in another part of India at her mother’s home but he insisted on flying her out in his plane to collect it. She recollected later that this was less a practical solution but a genuine act of kindness on his behalf, because it was the very last occasion that she saw her own mother. Working for Boy Browning was the beginning of a truly extraordinary adventure for my mother –he introduced her to a world where she socialised and worked with some of the most important figures of the day. When Lord Louis Mountbatten, the Supreme Allied Commander, South East Asia, needed a new chief of staff Boy was invited to take on the role and my mother accompanied him to Ceylon, which is where she met my father, Monty Baker-Munton. My mother of course got to know the Mountbatten’s well during this time and was present in Singapore at the Japanese surrender in 1945. Lord Mountbatten later used his influence to secure a new role for Browning on his return to England, as the Comptroller for Princess Elizabeth’s household, and Boy instructed my Mother to come and work alongside him at Buckingham Palace. She was a member of the Royal tour party at the time of the death of Princess Elizabeth’s father, King George VI, and she acted as a stand in during Coronation rehearsals. My mother’s first meeting with Daphne was when she returned with Boy from Asia to England in July 1946 flying in on Mountbatten’s plane the ‘Sally Ann’. Daphne’s own recollection of meeting my mother was not a particularly happy one. Daphne, now in her early thirties, had been apart from Boy for several years during the war. She had made a special effort to dress up to meet her husband’s plane but was unpleasantly surprised when Boy appeared on the tarmac with his youthful PA. Daphne described my mother as ‘menacing’, her short hand for anyone who was dangerously attractive. Daphne initially assumed that Maureen had been Browning’s mistress overseas, ignoring the fact that Boy was rather more interested in ensuring that my mother was correctly man handling all his luggage through customs. Despite Daphne’s initial concerns about my mother she was quick to pick up on her ability to deal with a wide variety of tasks efficiently and before long Daphne had exploited this to her advantage, so that my mother became not only PA to boy but Daphne’s London representative (Daphne spending most of her time writing in Cornwall). In the early days there were various curt letters sent from Daphne in Cornwall to my mother in London, asking her to collect underwear from the department store Peter Jones, in Sloane Street, or Daphne’s children from stations in London with instructions to send them on to Cornwall. At some stage in the mid 1950s the formal relationship between Boy, Daphne and my mother changed to a friendship which was to last for the rest of their lives and was to include both my father and me, when Boy became my Godfather. My mother’s resignation as Boy’s PA following her engagement was certainly one of the catalysts that put things on a different footing. 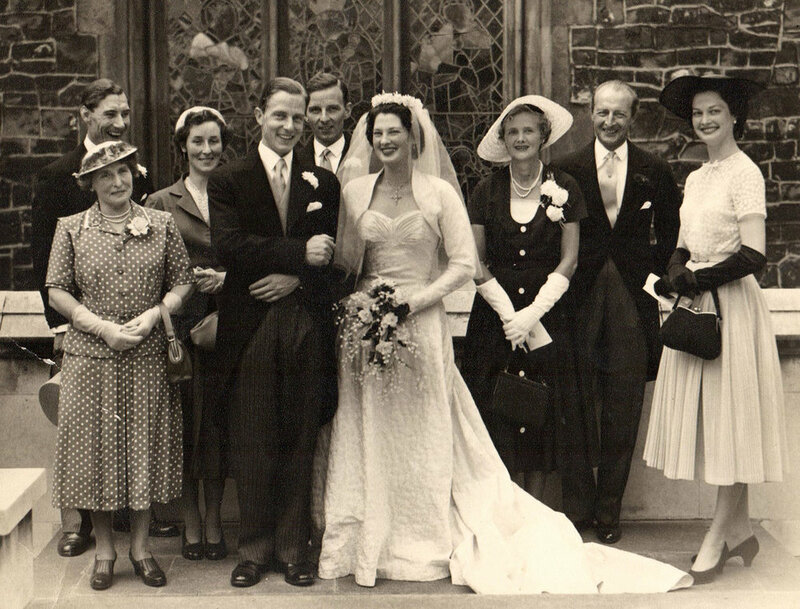 At the time Boy Browning was working as treasurer to the Duke of Edinburgh’s household in the Palace and when Boy announced to Prince Phillip that Maureen was leaving to get married and was rather worried about marrying outside her church (she had been brought up as a Catholic), Prince Philip, raised in the Greek Orthodox tradition himself, apparently retorted ‘All the best people do’. My mother of course had spent a number of weekends before her marriage at Menabilly, the Browning’s home in Cornwall and Daphne’s inspiration for the fictional Manderley in the novel Rebecca. Initially my mother worked on secretarial and administrative tasks for Boy but increasingly this extended to Daphne. My mother Maureen had really become indispensible to them both and even when she was long married herself, she continued to assist the Brownings with various things - such as their annual Christmas cards. I have no doubt that it was during these working weekends that my mother got to know Daphne better – in person Daphne became much less austere than those early letters indicate. In the end both my parents became close to Boy and Daphne and we used to holiday in Cornwall annually up until I was about 10. I remember Daphne as being easy going and I never felt awkward with her, although she liked her routine or ‘routes’ and kept to a strict timetable, writing in the morning in her cabin in the grounds of Menabilly and taking a constitutional walk with the dogs in the afternoon. Menabilly seemed huge as a small boy but I was an only child and felt there wasn’t a lot for me to do in Cornwall, although for my parents these were cherished holidays. I remember on one occasion my god father Boy shooting some real bows and arrows with me across the garden, many of which were lost, and I also remember exploring the derelict wing of the house which must have been fairly dangerous. Later after Boy died, and when I was around 16, I travelled on my own to stay with Daphne at Kilmarth, the house she had moved to after Menabilly. She made me feel at home although in some ways as a writer she was probably happiest as a lone operator, but I felt very relaxed in her company. She no longer had a separate place for writing and I recall her typewriter and desk in the house and some chap turning up at the gate to ask her to sign a book. I have since learnt that Boy’s and Daphne’s marriage was not straight-forward, both had a number of affairs. My parents might have been inclined to take sides but they somehow managed to straddle the various complexities deftly and never lost the affection or trust of either Boy or Daphne. My father became a Director of du Maurier Productions and later Daphne’s Executor, and my mother was given Power of Attorney, although these formal roles don’t really convey the reciprocal trust and loyalty between the two couples. Reading through the many letters to my mother from Daphne, there is an obvious change in tone from formality to friendship, perhaps more importantly for anyone interested in Daphne’s life they reveal her complex mercurial character and provide an insight into her relationships with family and friends and her literary triumphs and struggles. Almost always witty Daphne could be on the one hand robust, shocking, intolerant and dismissive and on the other open, perceptive and kind - she wrote movingly to my mother when my mother lost a baby and when I was preparing for boarding school, something Daphne had found very difficult to cope with when her own son ‘Kits’ had been sent away to school. My parents were undoubtedly valued by the Brownings but Daphne and Boy in turn were very important in the life of my parents and it was a friendship that they genuinely treasured.